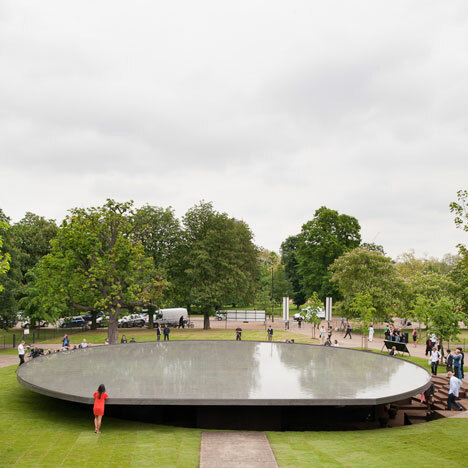 Here are some photographs of the completed 2012 Serpentine Gallery Pavilion designed by Swiss architects Herzog & de Meuron and Chinese artist Ai Weiwei, which opens to the public in London tomorrow. The base of the pavilion is sunken beneath the lawn of Kensington Gardens, where the imagined previously buried foundations of the past eleven annual pavilions have been unearthed and lined with cork to form a network of trenches. Twelve columns are positioned amongst these channels, representing each of the pavilions past and present, and supporting a circular roof. A pool of water covers the roof, but can be drained into an excavated well to provide an elevated viewing platform or dance floor. Cork-covered stools shaped like mushrooms provide seating for visitors underneath this canopy. The temporary pavilion will be open until 14 October. See more shots from the press preview in our Facebook album. Jacques Herzog gave us a private tour of the building earlier today, which we'll publish on Dezeen soon. The twelfth annual pavilion follows previous structures by architects including Peter Zumthor, Jean Nouvel, SANAA and Frank Gehry. You can see images of them all here, watch our interview with Peter Zumthor at the opening of last year’s pavilion on Dezeen Screen and read even more about the pavilions in our Dezeen Book of Ideas. Photography is by Jim Stephenson.